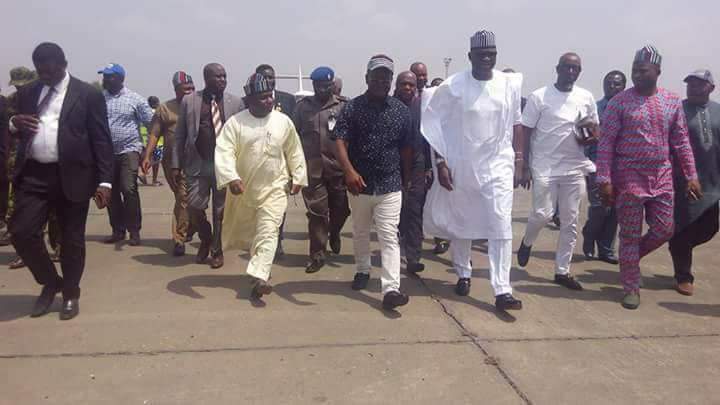 Governor Samuel Ortom of Benue State has revealed that he will dump the ruling All Progressives Congress, APC immediately the people of state ask him to do so. The governor was responding to the call by the Governor of Ekiti State, Ayodele Fayose who paid him condolence visit yesterday following the killing of several people of the state by Fulani herdsmen. He said, “I am a member of the APC and about the issue of joining another vehicle, Benue people are here and they are hearing you. I cannot decide for Benue people, the people will decide, it is what they want that I will want. Anything Benue people say I should do, I will do. “Nigeria can never be the same, Benue can never be the same because there is going to be a paradigm shift, there is going to be a turn around never witnessed in our history. “And one of them is that I have joined my brother Fayose to be outspoken on things that are done wrongly in this country. We have a constitution and laws guiding us and I believe in the rule of law and due process and anything outside that whether here or at the national level I must challenge.